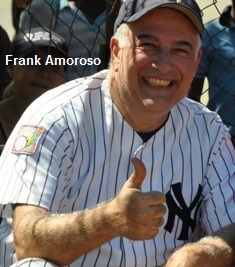 Frank Amoroso is a retired attorney in his 60’s and an MSBL veteran who now considers himself a full time writer and part time ball player while residing in Wilmington, North Carolina. Frank originally hails from Long Island and played in the Long Island MSBL from 1994 to 2007 for the Garden City Mets. Frank’s New York roots led him down the path of his love of one of the greatest figures in Major League Baseball history: George Herman Ruth. Babe Ruth is the most written about baseball figure in the history of baseball but the various pennings concentrate on the larger than life figure depicted in movies and accountings. But his beginnings in the world known as ‘Pigtown’ in Baltimore say much about Babe as a youth and how close he came to going the wrong direction into a much different life. Frank has compiled his own baseball resume as a southpaw pitcher from St. John’s University and a current participant, though admittedly more limited the past couple of years, at MSBL tournaments in Vegas with the Tri-Valley Antiques and the MSBL World Series in Arizona with the NorCal Antiques. Frank will be in Las Vegas this year at a speaking engagement promoting ‘Pigtown’ at the ‘Books or Books’ book sellers. The event will take place at 4:00 pm on Sunday, March 5th at 3460 E. Sunset Road in Las Vegas. The bookstore phone number is 702-522-7697. Those of you at week one of our MSBL Kickoff Classic might like to swing over and enjoy Frank’s anecdotes and baseball stories about the Bambino and pick up a copy. Below is the link to the publisher to order a book and donate a portion of the proceeds directly to MSBL. Please type in the code MSBL.